There’s starting to be a nip in the air; a few trees are turning lovely hues of red and yellow, and the days are getting shorter. Autumn is here – and I had a sudden urge to make soup. 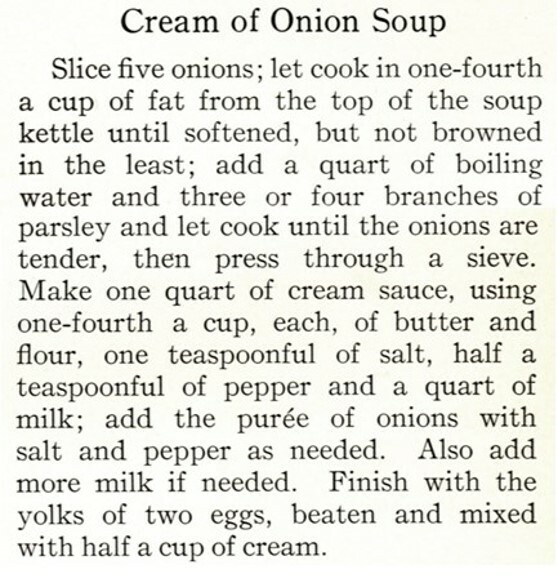 I found a lovely hundred-year-old recipe for Cream of Onion Soup. The soup was rich and creamy with flecks of onions. The recipe called for 1/2 teaspoon of pepper which gave the Cream of Onion Soup a delightful peppery undertone. Melt 1/4 cup butter in large saucepan, add sliced onions and saute until the onions are soft and semi-transparent (but not browned). Add water and parsley, bring to a boil and then reduce heat and simmer for about 10 minutes or until onions are tender. Remove from heat and cool slightly, then puree in a blender or food processor. Meanwhile, in a dutch oven, using medium heat, melt 1/4 cup butter; then stir in the flour, salt and pepper. Gradually add the milk while stirring constantly; then add the pureed onion mixture. In a small mixing bowl, beat egg yolks; add cream and stir to blend. Add a small amount (approximately 1 – 2 tablespoons) of onion mixture and stir quickly to prevent the egg from coagulating. Then stir the egg and cream mixture into the onion mixture in the dutch oven. Bring to a simmer and then serve. Posted on September 26, 2016 September 25, 2016 by SherylPosted in FoodTagged onions, recipe, soup. There is a similar recipe in the American Cookbook printed in the 1880’s. Wow, it’s amazing how far back brownies can be found in cookbooks. For some reason they seem like a “modern” food, when apparently they are a very old food. The soup looks really good. I’m enjoying your Fall photo. I’m glad you like the photo. I’ve been playing a little with the size – and finally decided to go with a narrow header and more distant picture–but there are things I like about both the narrow and wide versions of the header. Served with warm rolls.. Oh yum. Cooler weather hasn’t hit yet,but when it does this will be on the menu! mmm. . . it would be delicious with warm rolls. Memories of childhood! Thank you. I like the photo up top, too. It looks like the very essence of autumn. Lovely. It’s a nice soup for cooler weather. Looks very delicious and comforting! Soup is a good comfort food. Yes, the cool weather does make me think of soup. This looks delicious. Soup is so delicious when it gets cooler! Although we have to wait for that a couple more months, I printed this recipe to try in December – a creamy onion soup might become a new favorite! It’s a nice change from the ubiquitous French Onions Soup. No wonder we all know of the French Onion Soup because Cream of Onion was not passed along as readily. Thank you dear Sheryl for giving Cream of Onion Soup a new life!! It would be perfect with crusty bread. It sounds delicious! My father used to make lunch for me and my sister because he was a minister and home during the week. Once he made Campbell’s onion soup day in and day out. It was horrible after a short time. mmm. . . soup made from the fresh produce in your garden sounds wonderful. Sounds delicious! I have never heard of cream of onion soup. It’s a nice change from the usual French Onion soup. Looks and sounds delicious. I love making soup in winter and trying new soup recipes. I’ll definitely have to come back and visit to get this one. Sounds like a tasty soup to make to warm you up on a cool winters day. Soup in the winter is one of my favorite parts of winter. I enjoy how preferred foods change with the seasons. It definitely is Soup Weather – I totally agree. 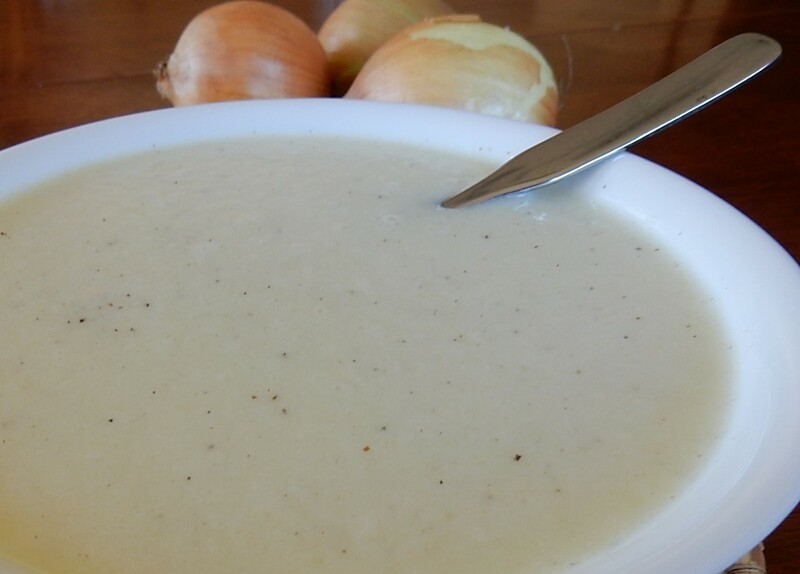 I have just posted my version of onion soup, but I have never tried Cream of Onion soup! Sounds delicious, and just what you would need on a cold winters day!